Humans have been fighting each other for thousands of years, but our ancestors had to worry about all sorts of savage killers. As an ancient, heavily gnawed femur bone highlights, we weren’t always at the top of the food chain. Half a million years ago during the mid-Pleistocene, it’s believed that humans and our hominin ancestors competed for food and space with large carnivores. But until now, there has been little direct evidence for fighting between man and beast during this time period. That’s why a 500,000 femur, recently unearthed in a cave site near Casablanca, marks an important—if rather grisly—archaeological discovery. The bone bears the telltale toothmarks of a hyena, suggesting that its luckless owner was either hunted or scavenged shortly after death. Either way, it’s a clue that before people had permanent settlements or even fire, we might have been an appealing snack to other carnivores. The discovery, led by Camille Daujeard of the National Museum of Natural History in France, is published today in PLOS One. “We know that hominins [in the Pleistocene] were quite capable of slaughtering large gregarious prey and evicting large carnivore from their habitats,” Daujeard told Gizmodo. But to imagine Pleistocene hunters as apex predators might be viewing the history of hominins through rose-tinted glasses. Grotte à Hominidés, the cave where the femur was discovered, is an important archaeological site that was used as a den by large and small carnivores throughout the Pleistocene. Close examination of the Homo rhodesiensis remains revealed numerous fractures, tooth marks, and pits. 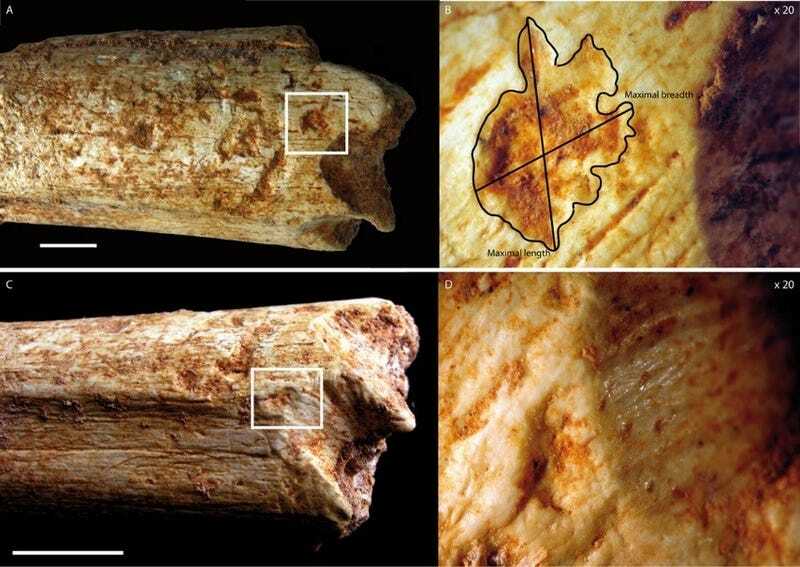 “This bone brings the first evidence of consumption of human remains by carnivores in this North African cave,” Daujeard said, adding that other predators, including saber-toothed cats, jackals, and the giant extinct baboon, might have also traded blows with early hominins. More work will be needed to confirm that hypothesis, and Daujeard is following up on her latest discovery with studies of other mixed-carnivore caves. But it’s clear that our Pleistocene ancestors must have been tough as nails. I certainly can’t imagine modern humans lasting long in a cave with a bloodthirsty hyena.